Home Archived news Minister Lukarski handed the first contracts under OP "Competitiveness and Innovation"
"The contracts awarded today are an expression of the commitment made by the government to support the Bulgarian business. They will provide financial resource for more than 200 small and medium-sized enterprises, which will help businesses to renew their technical capacity and provide employment." 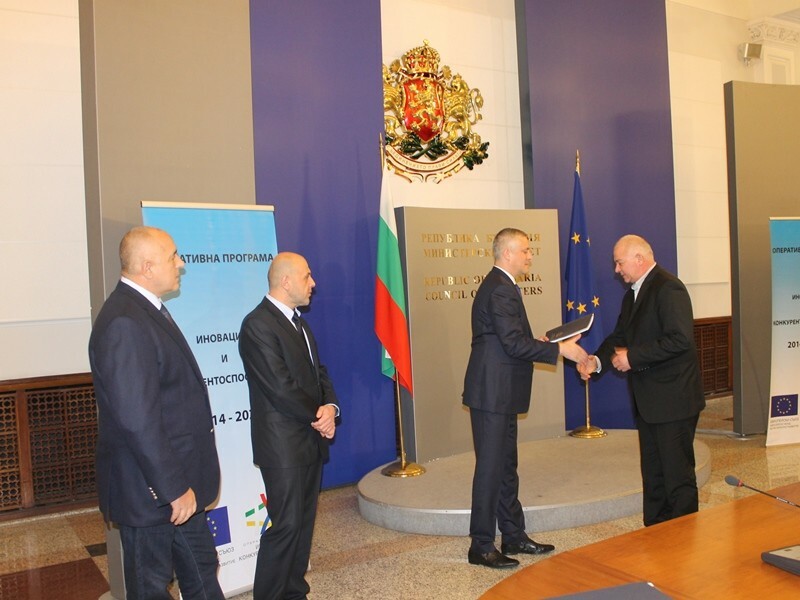 This said the Minister of Economy Bozhidar Lukarski, who together with the Prime Minister Boyko Borisov and the Deputy Prime Minister Tomislav Donchev handed the first signed grant contracts today under procedure "Improving the production capacity in SMEs" of Operational Programme "Innovation and Competitiveness" 2014-2020. Minister Lukarski noted that the interest in the first procedure was extremely large. Within the first deadline are submitted 844 proposals having economic activities in the sectors of low-tech and medium-low technology industries. Of them approved for funding are 202 projects worth BGN 116.4 mln. within the budget of the procedure. More than 500 projects also meet the financial and technical criteria and additional funding will be sought for them. With these European funds the companies will be able to buy machinery and equipment to expand their operations, to increase the production and provide new jobs, said Minister Lukarski. According to his words, the team of the Ministry of Economy and the Managing Authority managed to achieve most objective and transparent procedure with clear criteria for evaluation. He acknowledged that one of the challenges was that for the first time under the programme an electronic reception of project proposals is applied, but thanks to the efforts of the team of the Ministry and that of the Deputy Prime Minister Tomislav Donchev, everything was done successfully. "From now on, the ball is in the entrepreneurs," said Minister Lukarski. He urged the business to implement their projects correctly and expressed hope that there would be no imposition of financial corrections. "There are already 229 approved projects under the second deadline of the procedure for improving the production capacity of high-tech and medium high-tech enterprises. They should also receive their grant contracts until the end of January," said the Мinister. Within the third deadline for enterprises in the intensive knowledge services sector are submitted 203 project proposals. These proposals are currently being evaluated. By the end of the month will be also open a procedure for implementing of innovations by start-ups. At the ceremony today were handed the grant contracts to 27 companies that received the highest score and responded to the highest level of the evaluation criteria. At an official ceremony on January 7 Minister Lukarski will hand also the other contracts under the first deadline of procedure "Improving the production capacity of SMEs. It was noted that one of the main focuses of the program for targeted support for the Northwest region is filled, where increased interest is reported - 57 of the project proposals for "Improvement of production capacity in SMEs" under OPIC are submitted from this region.